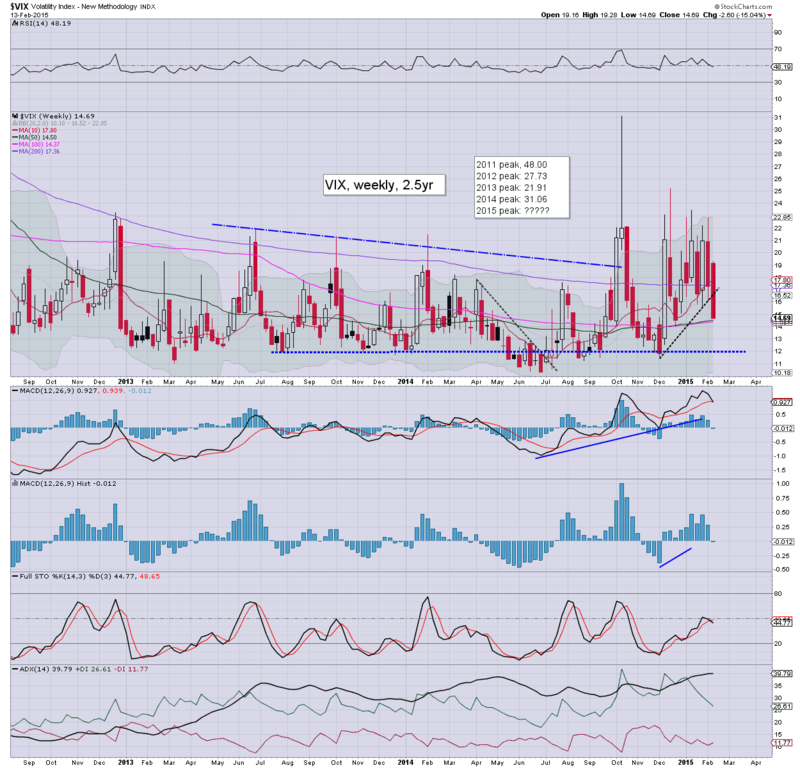 With equities breaking new historic highs, the VIX continued to broadly cool, settling -4.2% @ 14.69. 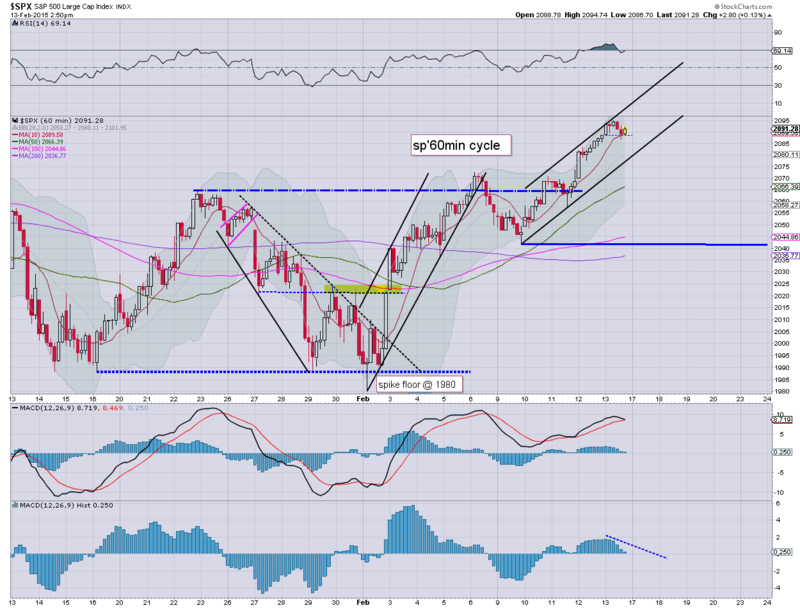 Near term outlook offers a minor chance of a bounce to the 16/17s, before renewed equity upside into the sp'2125/50 zone. 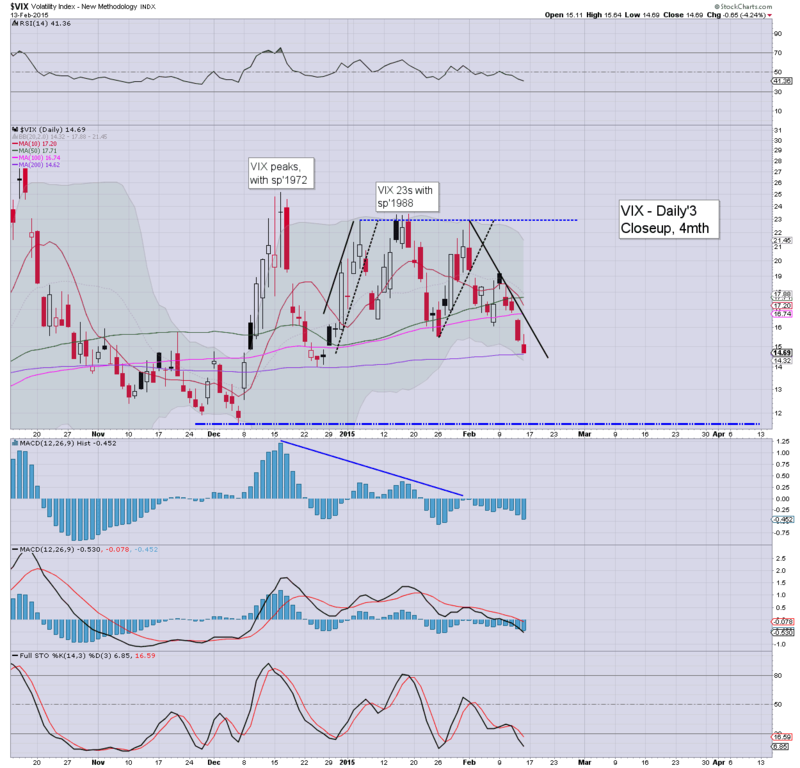 VIX 20s look highly unlikely in the near term. 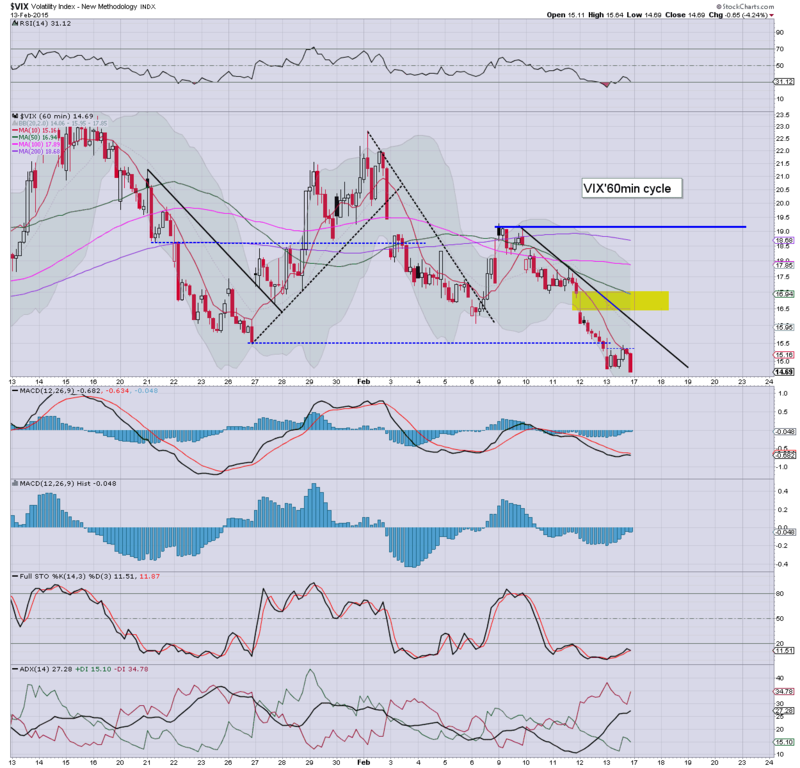 VIX saw a notable second consecutive net weekly decline of -15.0%, settling @ 14.69. *I hold a VIX-long position across the long weekend, seeking an exit in the 16.50/17.50 zone next Tuesday, I am not hopeful of a breakeven exit.. and it remains a failed speculative trade. 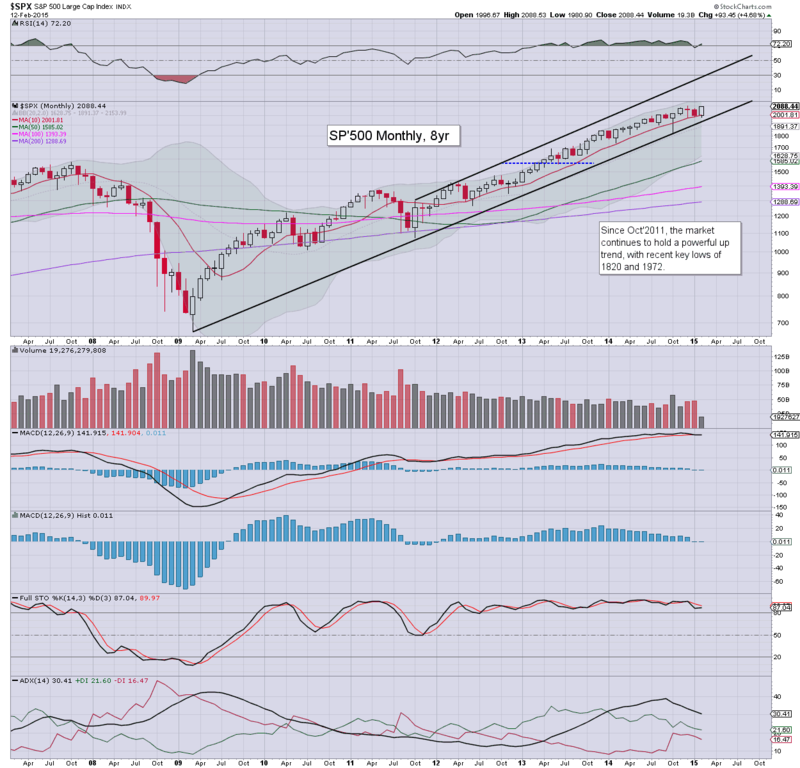 US equities closed moderately higher, sp +8pts @ 2096. The two leaders - Trans/R2K, settled higher by 0.2% and 0.6% respectively. Near term outlook offers a small chance of a retrace on Tuesday.. but overall.. the broader picture looks strongly bullish across the spring. ... and another week comes to a close in this twisted casino. There will doubtless be a lot of rumour and speculation about the EU meeting with Greece - set to resume next Monday, but there appears little reason why the Greeks won't do as they are told. Right now... there is little else to add. Regardless of the exact close, the equity bulls are set for the second consecutive net weekly gain, some 1.7% for the sp'500. With a new historic high, there is very little for the bears to look forward to.. not least with the Greeks set to bow to their German masters next Monday. Hourly MACD cycle is set to get a bearish cross in the closing hour.. that bodes for some weakness... with the 'rats selling into the long weekend'. 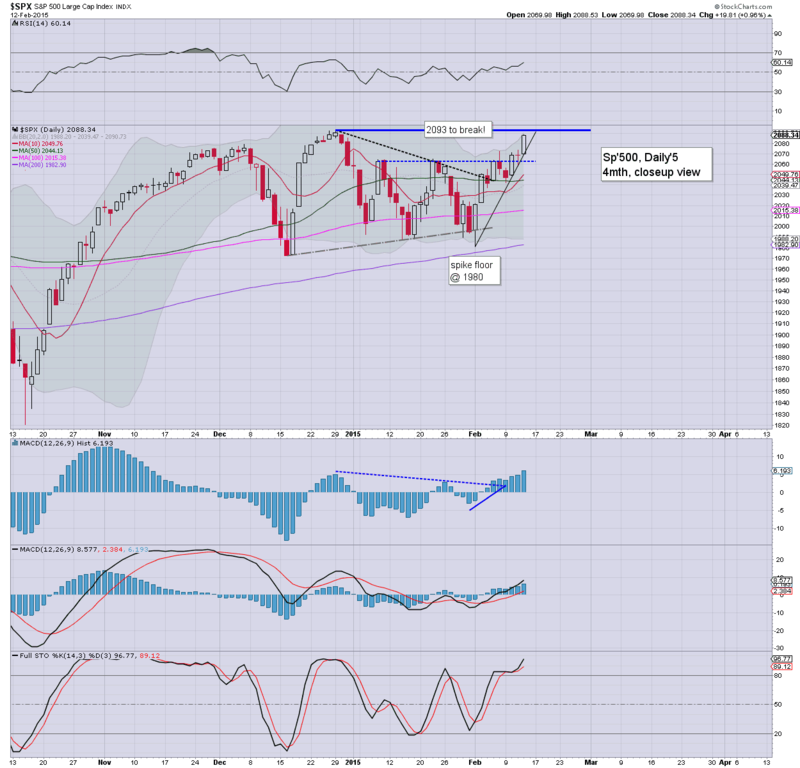 Overall though.... the broader picture remains outright bullish. *the gains in metals are kinda interesting, but they don't negate the mid/long term down trends from spring 2011. 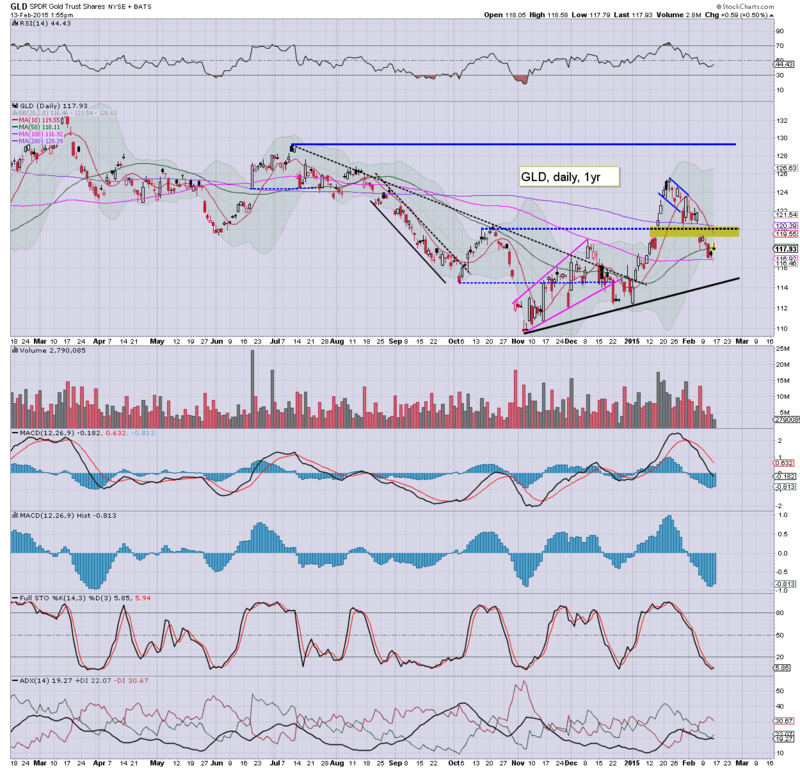 Indeed, right now, GLD is offering the second consecutive daily black-fail candle.. that bodes for the metal bears next week. Marginally interesting to see the market turn red.. but clearly.. its nothing significant. Indeed, right now.. there is no reason to get excited... if even the low 2070s next Tuesday.. and that sure doesn't look likely. notable weakness, SDRL, -5.8%.. after giving up hope on a $1.1bn order. Market mood is one of confidence, with next to zero concern about the EU meeting resuming next Monday. US equities are highly vulnerable to opening in the sp'2100s next Tuesday. Instead... lets see Mr Topstep. *I remain long VIX, but with a dead stop at 14.80... right now, I expect to be kicked before the close of today. 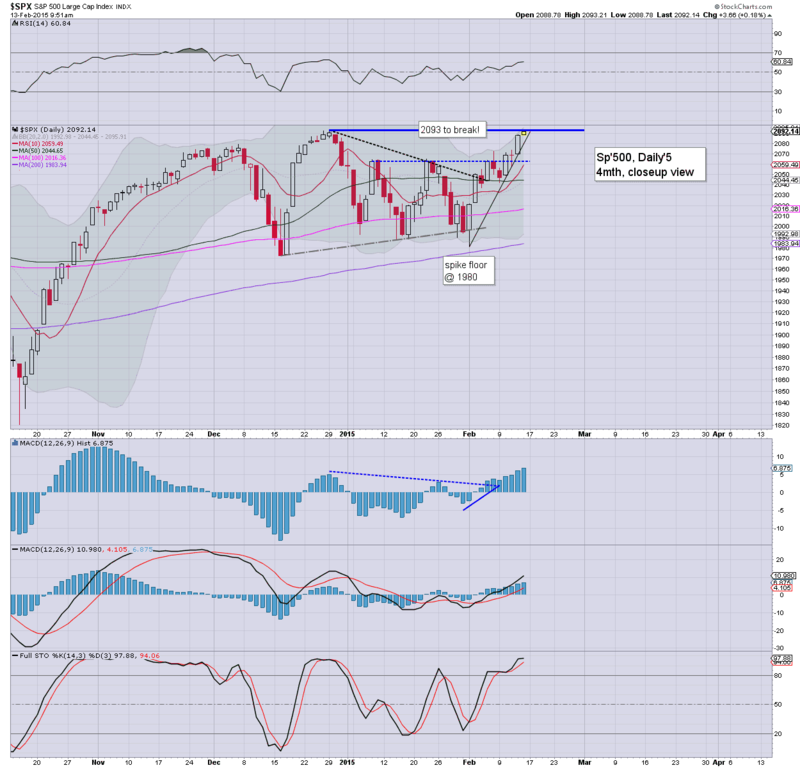 There is no point holding if main market is going to grind higher into the sp'2125/50 zone into early March. The Nasdaq broke a new post 2009 high yesterday.. this has now been reflected in the sp'500, hitting a new historic high of 2093.65, a mere (but important) 0.1pts above the late Dec' high. VIX slipped to 14.79 in early trading, but is currently making a move to break declining resistance... which at the Friday close will be around 16.00. Suffice to say... I am holding no significant hope that the Greeks will stand up for themselves. Instead, we'll surely see a 'kick the can' agreement next Monday. 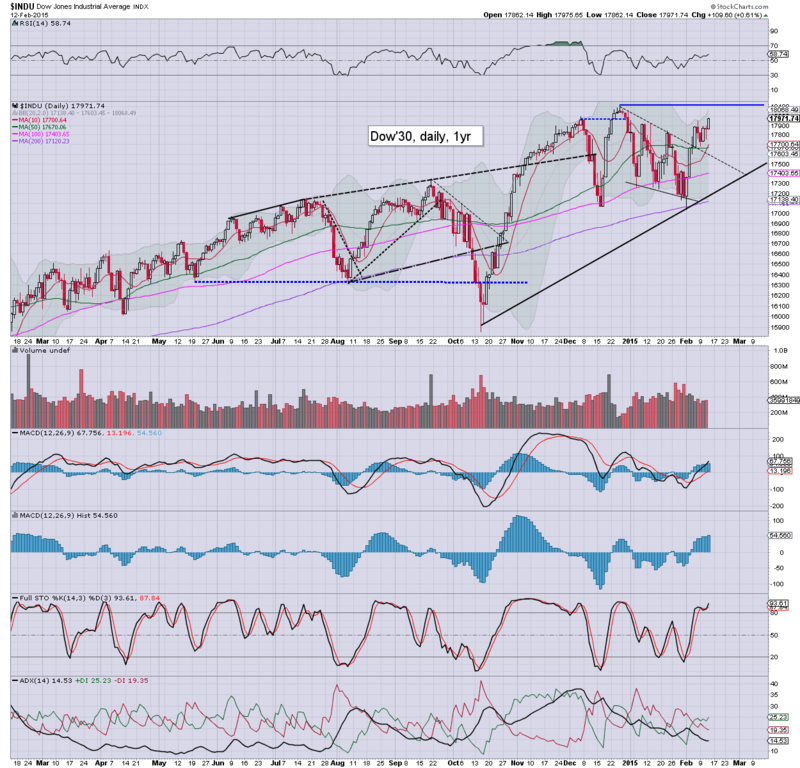 That will offer the equity bulls a straight gap into the sp'2100s next week. It is notable that the monthly cycle is offering 2150s in the immediate term.. although weekly cycles will restrict that level until early March. *I have a dead stop on my legacy VIX position @ 14.80... will look to raise that today (if possible) and close out for the weekend. Seems little point in holding beyond that. 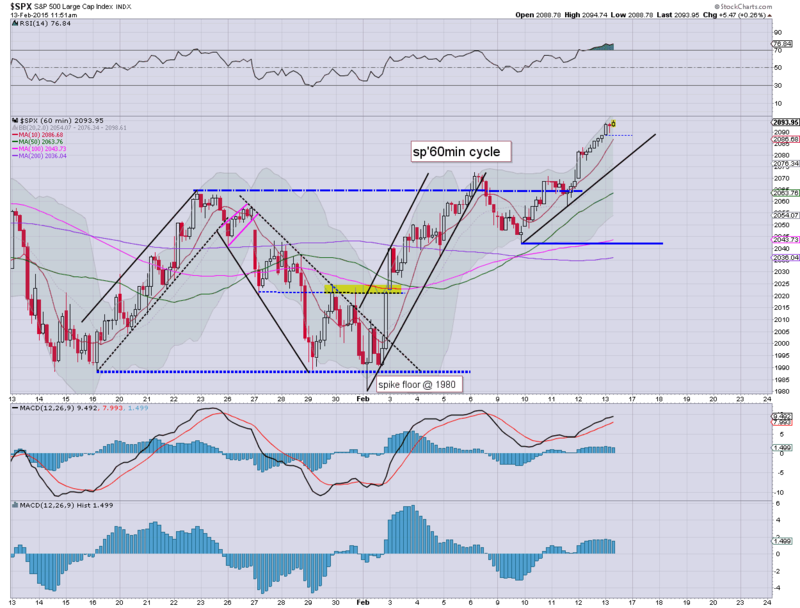 US equities are making a play for new historic highs, with the sp'500 @ 2093. Metals are battling to end the week on a positive note, Gold +$8, with Silver +2.5%. 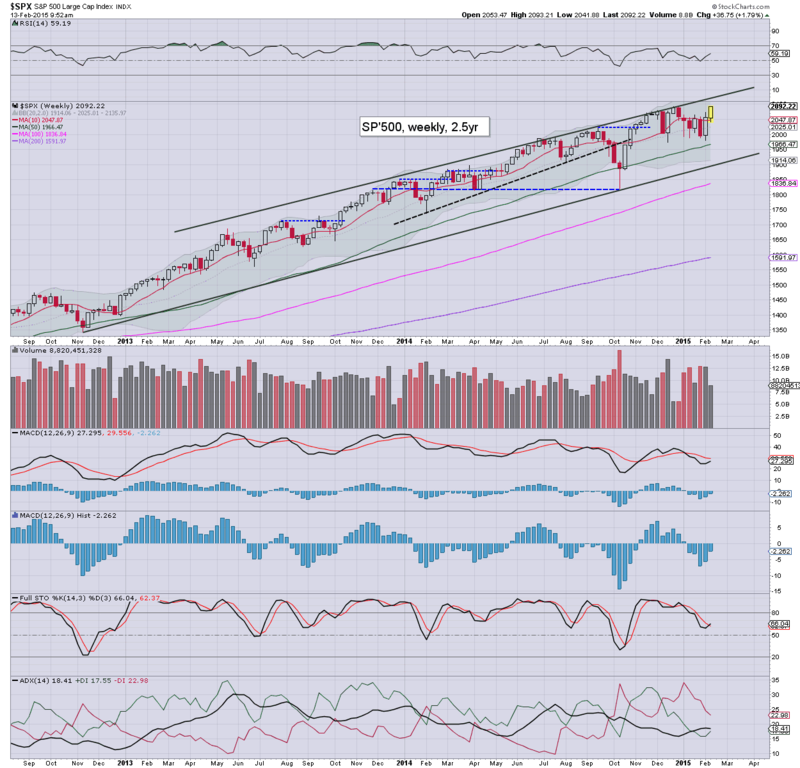 *a rather impressive net weekly gain of around 1.8%... giving follow through from last weeks hyper-gain. There is of course the resuming EU meeting next Monday, but we know the Greeks will do as their German/EU masters wish... right? I would imagine some of the members of Golden Dawn will want to pay the Greek finance minister a visit this weekend, after being sold out to the bankster class...again. Notable weakness, SDRL -5.6%... not sure why... I've not looked yet. Futures market earlier (I believe) has already broken a new historic high. It would seem the cash market will follow at some point this morning. *I am largely burnt out this week, and its not even particularly market related. I will endeavour to be here across the day.... but if I disappear.... its because I've fallen asleep. US equities saw a rather important day of gains... with a notable gain of 1.2% for the Nasdaq Comp', a new post 2009 high... bringing it within 275pts (5.6%) of the spring 2000 high of 5132. With the Greeks set to capitulate to their German/EU masters, the door is again open to the sp'2100s. You know... for a moment... just a moment, I actually thought maybe the Greeks might finally stand up for themselves. 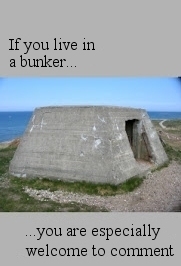 .. but no. From the many leaks (especially the intentional ones), rumours, and other 'educated speculation', it would seem the Greeks will do as they are told. The new Greek leadership will soon renounce on the very things they promised those who voted for them. 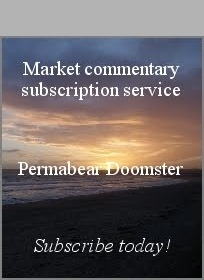 The week will conclude with import/export prices and consumer sentiment. *With the market closed next Monday for 'Presidents day', there will be some of the usual pre-holiday trading issues. Trading will likely be increasingly choppy and light in the afternoon. The only issue to counter that is 'who wants to hold across the weekend'.. with the EU resuming Greek talks next Monday. 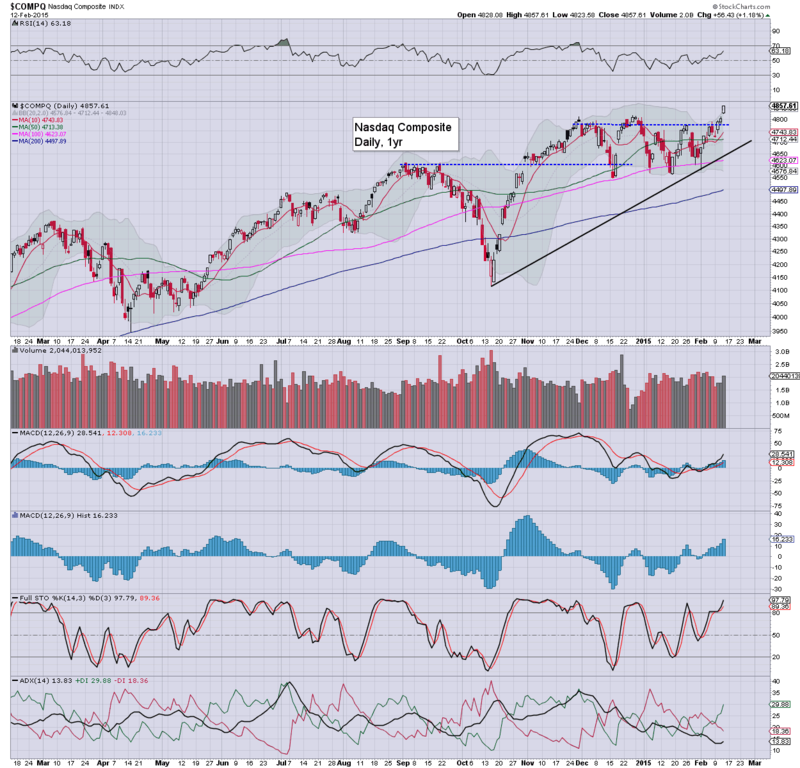 US equities closed with rather significant gains, sp +19pts @ 2088. The two leaders - Trans/R2K, settled higher by 0.8% and 1.2% respectively. Near term outlook offers new historic highs, which will open the door to the 2120/50 zone by early March. 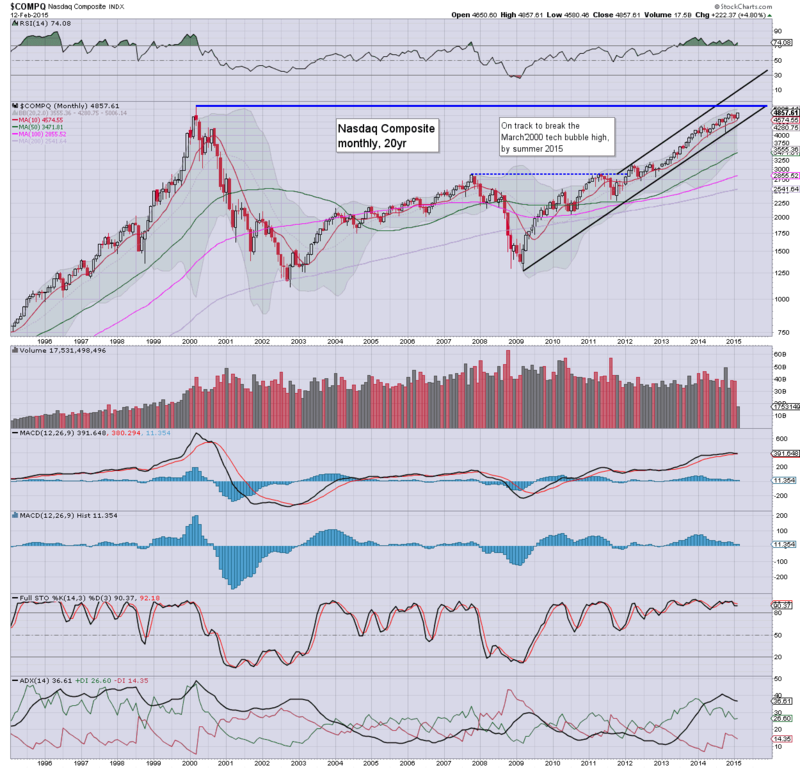 *most notable, the Nasdaq comp'.. new post 2009 highs... set for the giant 5k threshold.. and the March 2000 bubble high of 5132. Little to add.... all indexes look set to claw higher.... not least if the Greeks capitulate to the majority of demands from the EU.